Dr Aled Jones, director of the institute, which is based at Anglia Ruskin University, said "heavily indebted" countries were becoming increasingly vulnerable to rising energy prices. "The EU is becoming ever more reliant on our resource-rich neighbours such as Russia and Norway, and this trend will only continue unless decisive action is taken," he added. The report painted a varied picture across Europe, with Bulgaria having 34 years of coal left. Germany, it was claimed, has 250 years of coal remaining but less than a year of oil. Professor Anderson said: "Coal, oil and gas resources in Europe are running down and we need alternatives. "The UK urgently needs to be part of a Europe-wide drive to expand renewable energy sources such as wave, wind, tidal, and solar power." However, Jim Skea, Research Councils fellow in UK Energy Strategy. cast doubt on the findings of the report. He told BBC News: "This sounds very unlikely. What's more, it's irrelevant - the UK has a stable supply of imported energy, even if it is a good idea to increase our own supplies." The government recently announced it was cutting subsidies for large-scale solar energy and the Conservatives have said there will be no funding for new onshore wind farms if they win the next election. Ministers are hoping that enough shale gas - extracted by fracking - will be obtained to make a difference, the BBC's environment analyst Roger Harrabin says. They are also offering incentives for more oil research in the North Sea - and trying to persuade the USA to export more gas, he added. The Global Sustainability Institute's research covers environmental, societal and economic challenges facing the world. 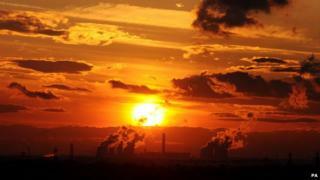 A Department of Energy & Climate Change spokesperson said the premise of the report was "nonsense". "The UK is one of the most energy secure countries in the world thanks to the combination of our own reserves, our diverse sources of imported energy and our focus on increasing clean, homegrown energy in the UK - which includes nuclear, renewables and carbon capture and storage. "As well as attracting record investment into our energy security since 2010, the UK is leading globally on energy security, particularly through the G7 which has agreed to take global action to improve energy security, and in getting a deal in the EU to cut carbon emissions by 40% by 2030."